What makes for a great night? Something unique, memorable, and fun! If you are left scratching your head and trying to figure out what fits those requirements, we’ve got the solution for you! On Friday, June 20, 2014 we are hosting a Jam Skating Demo at the Hudson Roller Kingdom! If you are new to the lingo, then we will break it down for you. First, we are talking about jam skating, as in a style of skating that’s been about since the 90’s! Some describe it as break dancing on wheels. That’s what we are talking about for Jam Skating; we are not talking about strawberry or raspberry jam. Those don’t really have anything to do with our Jam Skating Demo, but they do work well on a peanut butter and jelly sandwich! Second, when we say demo, we mean demonstration and not demolition. Just because Jam Skating is known as break dancing on wheels, it doesn’t mean that anything is actually going to get broken or demolished! Who: You and your crew! Bring em out! 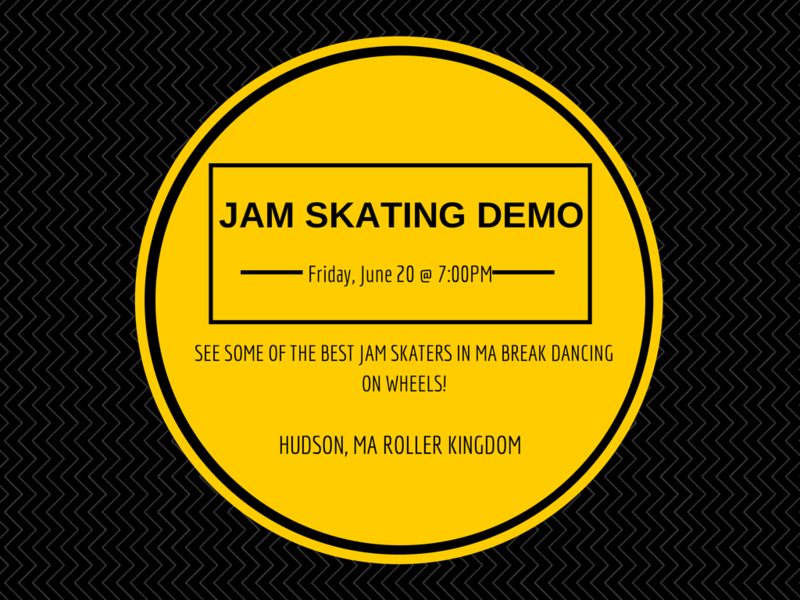 Who know’s we might get you out there Jam Skating with us, be ready to show off your moves!